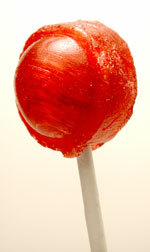 Spoof news: Ex-Paris Hilton groupie and stick-woman Nicole Richie gives birth to lollipop! Ex-Paris Hilton groupie and stick-woman Nicole Richie gives birth to lollipop! LOS(T) ANGELES - CALIFORNI(C)A: Lionel Richie's little girl - the drugged out, drowned-in-drinks, wanna-be everybody's friend, socialite screw-up, Nicole Richie gave birth yesterday to a 2-pound lollipop. Immediately thereafter, an-anorexic Nicole began hungrily licking and chewing little Harlow Winter Kate while telling reporters: "Animals in the wild lick and chew their little ones and I plan to do the same to little Harlot. I'm gonna be the best mom ever". Grandpa Lionel Ritchie, upon noticing part of little Harlot's chewed-up toes under Nicole's pillow, tried to put them back on his new lollipop gal while crooning "Hello, is this what you're looking for?" Sources say Nicole would like to patch up her differences with ex-buddy Paris by naming her Harlow's godmother. It is understood that Paris said she would have preferred being godmother to a large cucumber rather than a skinny lollipop. "I mean, like, what good is a lollipop when I'm such a better licker".